IRDG visit to Tyndall – a real eye opener! On 5th March 2013, the Tyndall National Institute hosted an IRDG member’s Innovation Practice Group visit. Tyndall is one of the most renowned research centres in Ireland, and we were delighted that they agreed to share their developments and technologies with our members. This was a great opportunity to see leading world-class research being conducted in the areas of Nanotechnology, Photonics, Life Sciences & Healthcare Systems and Energy. The research underway in Tyndall has wide reaching applications, particularly in Communications, Energy, Environment and Health. The session provided some interesting insights as to how these technologies could be applied in various industries and business environments. It really opened the eyes of all in attendance as to the kinds of research activity which is underway, and to the ways in which it could be applied. It also got people thinking about the needs that existed within their companies, and how they too could develop their R&D with the support of Tyndall and other external expertise. The Tyndall Team are open for business and very interested in talking to and meeting with companies who are interested in collaborative work. 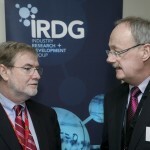 The primary contacts include Kieran Drain, CEO (kieran.drain@tyndall.ie) and Michael Grufferty, Head of Industry & Innovation (michael.grufferty@tyndall.ie). They are very welcoming of companies visiting Tyndall and exploring if and how Tyndall could support them in their research needs. Further information is also available from the IRDG. Finally, we would like to express our sincerest thanks to Tyndall for their welcome, hospitality, sharing of expertise and facilities. It was a challenge to pitch the message to such a diverse group of members without getting lost in the technical detail but collectively we received a very good overview of Tyndall’s capability along with much food for thought. Thank you all.